David Blaine Live. My favorite magic show so far…….. This review is based on David’s performance at the Moody Theater in Austin, Texas on July 18th 2017. David Blaine Live: After a couple of decades as a television magician these words almost seem like an oxymoron. However, Blaine’s current 2017 North American, 40-city tour is proving so successful that anyone attending one of the events can assure you that he might well be the most effective live performers that magic has ever seen. The Austin City Limits Live–Moody Theater seats 2750 spectators, and is Austin’s premiere music venue. Blaine’s show on July 18th was a sold out event. Waiting for the show to begin there was no question that the capacity crowd was expecting something both different and special to take place, and they were certainly not disappointed. 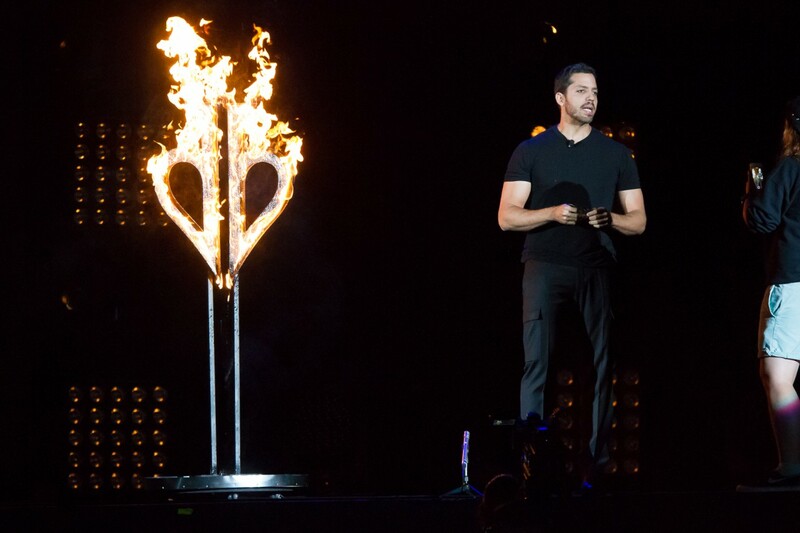 Let me make it clear from the outset that I went into the concert as quite a fan of David Blaine, and his singular approach to entertaining with his curious blend of sleight of hand and endurance stunts. You really have to go back to the iconic Houdini to find a magician who has created something different enough to have audiences so totally baffled that they are left wondering if something quite beyond every day reality, or trickery, may be the key to his feats. David Blaine inspires an almost cult like following from his audiences by adding genuine mystery to his performance and persona. It shouldn’t, but probably does, need pointing out that magicians are the furthest distance possible from being Blaine’s strongest audience demographic. 2 Folded card from sewed shut mouth. 4 Psychic tapping/Paper cup roulette/Ice pick through arm. 5 Guest set by Asi Wind. 6 Frog regurgitation/Ring on Coat hanger. 8 Breath holding in tank. 10 Card trick with junior magician in audience. Due to problems with the Fire Marshall, Blaine was unable to perform his amazing “water and kerosene” effect. In previous shows he had used this effect in the all-important second to closing position occupied by his underwater endurance stunt. I am not sure if he has been regularly performing both of these pieces in the course of the same show during the tour. However, my intent is to discuss the specific show that I saw, rather than the variations that have popped up along the tour. Most of the set pieces included in the show have been seen on his various TV appearances and can be found on YouTube in one form or another. I consider the structure of the show masterful, and in this brief review can only hope to hint at some of the strengths that the construction contained. You will notice that I included the brief introduction video as an integral item in the make-up of the show. 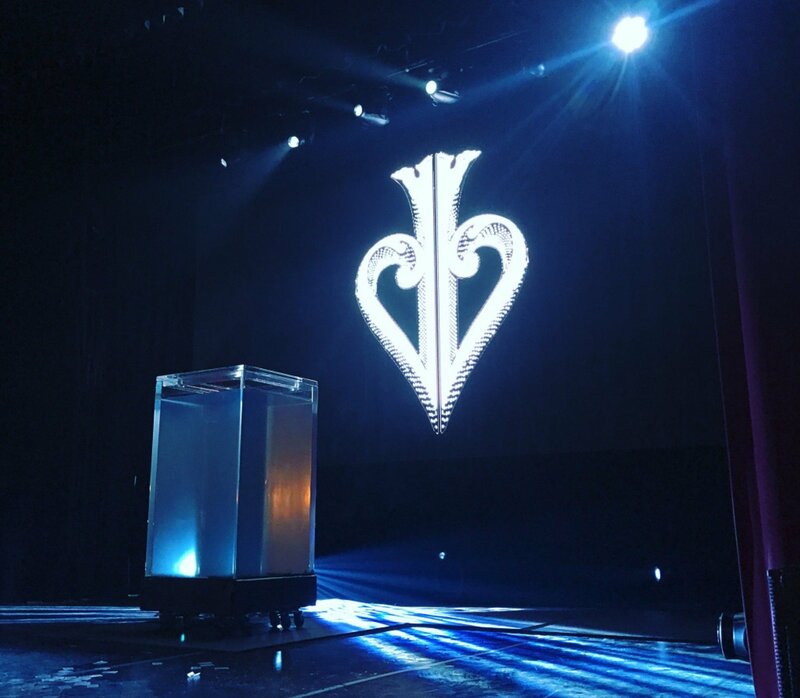 It incorporated a key framework to the show that was to follow and set the stage for a large part of the success of David Blaine’s approach to magic. I have long been a fan of the late, great mentalist Al Koran’s opening statement in his show. Koran freely mixed mentalism and stage magic in his “mind reading” show; in fact he frequently began his mentalism show by performing a Three Ring Linking Ring Routine. Koran preceded the ring routine by stating that in his performance he was going to mix items that were tricks and others that were not, and that he was going to start with a trick so that the audience could tell the difference. A brilliant opening statement that disarmed the audience while in no way interfered with anyone’s belief in his possible powers. Blaine’s ultra-cool opening video does much the same thing and firmly establishes an interesting and provocative overview of the dichotomy central to his work. The blending of fairly traditional sleight of hand and the stunt/sideshow aspects of Blaine’s repertoire is much in evidence in his opening routine, and also the masterful manner in which he sets up his genuine Ice Pick Through Arm with the foam coffee cup roulette effect. A large part of Blaine’s impact on a lay audience is the way he shifts (without removing) the emphasis from “How a trick is done,” to “If a trick is done.” The only effect in Blaine’s show that resembles a conventional magic trick is the second effect where a spectator appears to freely select the one missing piece to a completed jigsaw puzzle. This was the one effect that I personally could have lived without, however, the impression on the audience was huge and the crowd enjoyed the subtle shout out to his current location. One thing that can’t be overstated in discussing Blaine’s show was how superb the I-Mag and video assist was throughout the evening. The video images were crystal clear and covered the action whether it was a piece of thread, a needle, a deck of cards or a gigantic tank of water. I was in awe of the great work that the video team added to the mix in making every action and emotion crisply accessible to the live audience. The first time I ever saw video assist used onstage in a theatrical magic show was when Doug Henning had two giant TV sets brought out onstage at the Schubert Theater in Los Angeles back in the ‘70s. It was an innovative gimmick back then, but it is a necessary and stunningly effective tool in Blaine’s show. The cameras were used as magnifying glasses for the magic while at the same time allowing Blaine to achieve a totally natural effect with his patented deadpan delivery. I was surprised and delighted to see how much laughter was involved in the show. It was fascinating to see the amount of natural humor that David created during the evening without once abandoning his character in order to tell an old fashioned joke. Blaine achieved an easy and accomplished rapport with his audience that was all the more impressive given the relative dearth of his previous live performances in large-scale theatrical venues. The guest set by Asi Wind was a real highlight in the show, and Wind’s combination of sleight of hand and mentalism created a change in tone and texture that added greatly to the impact of the show in its entirety. Personally I have always disliked Rubik’s Cube magic with a passion, but in Wind’s hands I found myself shouting and applauding along with the rest of the crowd. Asi was smooth and strong in his segment and the crowd loved him.It was very apparent that David and Asi are good friends, and Blaine’s introduction of his guest made sure the audience grasped his role and place in the show. My wife, a 45-year veteran of attending magic shows that she usually doesn’t want to see, really enjoyed the entire evening much to her surprise. Susan, like myself, thought this was the best full evening magic show she had ever seen. However, she really made me laugh when she stated that watching David and Asi was like watching the ultimate magic nerds performing a great parlor show on a huge stage. I know exactly what she means, and it certainly wasn’t a negative comment; she just knows her magic really well! Taking advantage of his brief break from the stage during Asi Wind’s set, Blaine did whatever the hell he needs to do to prepare for his astounding interlude with Candy his show stealing frog. The resulting routine is quite simply unbelievable, and with its recent TV exposure, may well have been the effect that the audience was most eagerly waiting for. Once again Blaine’s handling of his onstage audience volunteers was an exercise in relaxed but careful control. He managed to make the young couple appear relaxed in ridiculously non-relaxing circumstances, and extracted every last reaction from them without ever crossing any line in making them seem in any way exploited. When the curtain reopened after the interval, a large, water filled tank was located center stage. Sitting on top of the tank was Blaine quietly taking puffs of oxygen from a tank while a video prepared the audience for the breath holding endurance stunt that was to follow. When magic enters into any of these “escape” like scenarios it usually means that the presence of Houdini will be invoked and probably one of his effects will be duplicated or (gasp!) improved upon. As Blaine makes clear Houdini was a childhood inspiration and a large part of his performing vision. Blaine seems very comfortable and understated in his realization that to current (and especially younger) audiences he has become the contemporary version of his childhood hero. Magicians often seem to fail to realize that Houdini is not the same cultural icon to lay people that he is amongst the magic community. Like Blaine most of us spent our early years absorbing the Houdini myth. By removing the “escape” trimmings to his stunts, Blaine has created an entirely new form of entertainment in much the way Houdini did when he added the concept of escape to the lexicon of magical entertainment that existed in his own day. 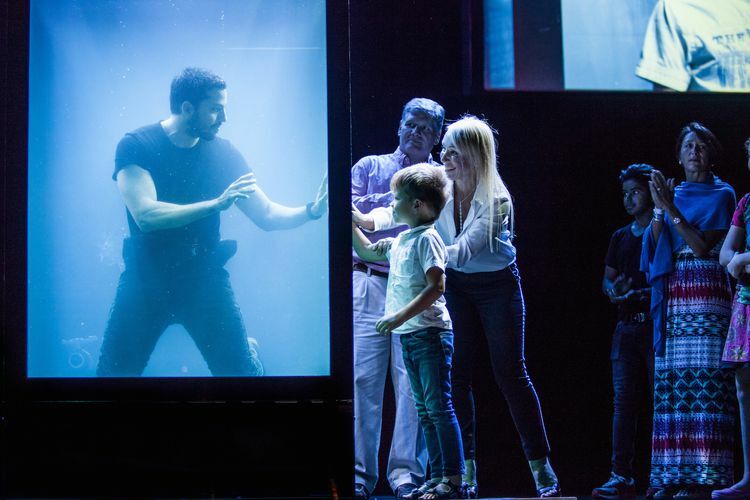 The 10 plus minutes that David Blaine remained submerged under water were impressive, dramatic, eerie, and strangely meditative. The spectacle was profound and the staging was gloriously pure theater. The standing ovation that followed the demonstration was spontaneous and curiously transcendent, and much more fulfilling than I could ever have guessed it would be. After the stunt, David sat shivering, draped in towels on the edge of the stage for a Q & A session that was in turns inspiring, entertaining, informative, and revealing. It was during this low-key interlude that I realized what a great sense of vulnerability Blaine was sharing with his audience. It was an element I had never really noticed in his TV work but illuminated the entire evening’s entertainment. It is not a quality that one much associates with world class magicians, and it was a powerful indication of why he has become such a mega star in the magic world. There was a true sense of sharing between Blaine and his audience, and it was very effective in the way it united all those present. In a beautifully nuanced closing to his show, Blaine invited a young magician onstage with him and then helped him perform an effect for that huge audience as a finale to the show. Jackson, a fledgling 15-year old magician who shared the stage with Blaine in Austin, was so excited about what was happening that his hands were shaking wildly as he compulsively shuffled a deck of cards awaiting his instructions from his hero. Blaine whispered his instructions in Jackson’s ear and then stepped back and really did let him finish the trick to end the show. The moment was truly Jackson’s, and Blaine really allowed him to own it. The resulting standing ovation was a remarkably effective end to the show that said an awful lot about the true heart and spirit of magic. 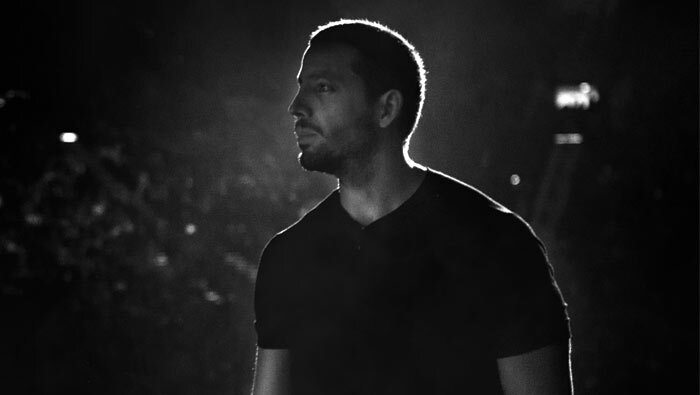 It may not translate into my words comfortably, but in live action and under the spotlights it was a true insight into what makes David Blaine magic’s first reality star. 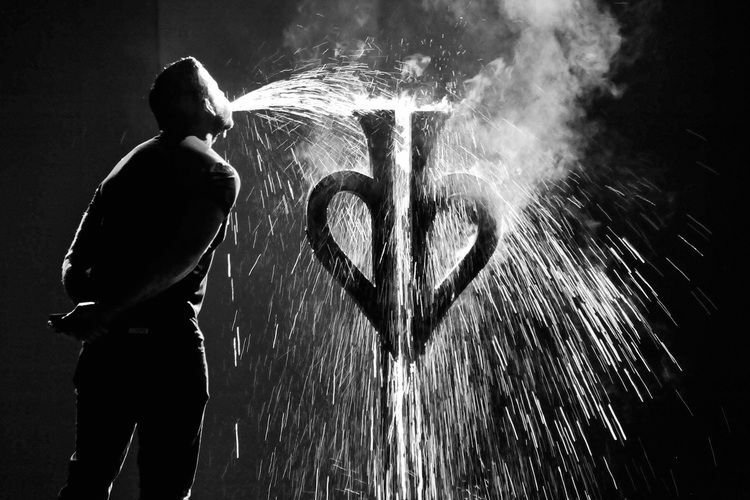 If you have a chance to catch David Blaine Live I cannot tell you how strongly I recommend you take that opportunity. Just as David Blaine: Street Magic (1996) turned magic upside down with its understanding of how to blend the future trend of reality TV programming and variety entertainment, Blaine is blasting a new direction and pathway in the presentation of live magic. In the past 50 years I have only seen a handful of magicians perform a full evening theatre show; the others were Doug Henning, David Copperfield, Siegfried & Roy (at Radio City Music Hall), and Penn &Teller. Out of this distinguished group David Blaine delivered the performance that I consider the best, I can’t really say more than that. ~ by Nick Lewin on August 28, 2017. Now, we have “honest individuals” people, that are giving this a thumbs up…..
Well gee guys, do we buy into this or not??? Well, since this is Nicky, I buy. Why??? Because he has seen it all….like it or not!!! Plus, he is a THINKER!!! So, take a deep breath, accept it …and take a closer look at reality. Maybe…just maybe…Nicky has hit the nail on the head!!! Go and see for your selves!!! Then, and only then, give it YOUR GUT REACTION. As Patrick Page would say….. Yes Tim, I had severe misgivings but the show totally won me over. I strongly advise every magician to catch it if they can!